I am 44 years old, married and mother of a 19 and 5 year old. I am very outgoing and always up for a challenge. I love meeting new people and love to laugh. My passion for running started a few years ago with some other moms who were looking to keep fit and social. This happened before my little one was born when we were just running from one lamp post to the next. I remember challenging ourselves to start running 2 lamp posts and before we knew it, we had entered a 5km race. That was when the bug bit me. It was tough but felt so right completing the race without even winning it. I then moved areas and didn’t have my running buddies anymore. Three years after my baby was born, thankfully I saw the CMIYC group in Edenvale on Facebook and jumped at joining them. Sarah and the ladies were super encouraging, motivating me all the way. Friendships were built and before I knew it, I was running the Rundela 27km with these ladies. 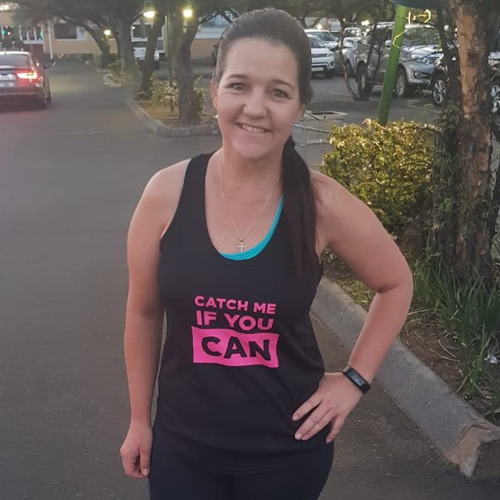 Now that our Leader Sarah is moving on and out of the Edenvale area (thankfully not to far), I am hoping to carry on what she started and help and motivate all ladies to start running. Download the App to join Mandy’s Group Runs.